Primary particles are vacuum dispersed in air or liquid on object glass prior to image analysis and magnified. Particle shape e.g. aspect ratio (ratio between breadth and length) which gives valuable extra information -complementary to laser diffraction – about particle characteristics. Overview of particles dispersed in liquid or air. Observation of foreign particles in the sample (pollution). Suspicion of pollution should be followed by elemental analysis by EDX/SEM to confirm foreign particles. Measurement of object sizes e.g. mesh size of sieves. It is possible to determine the particle size distribution by number or calculated volume (0.5 µm – 2 cm). For size distribution purposes more than 3000 particles are typically processed. 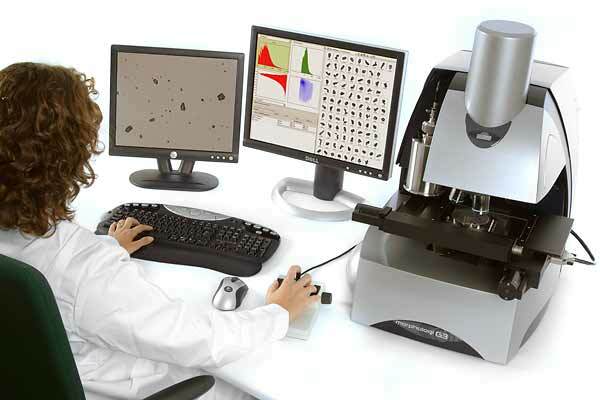 Particle Analytical uses Morphology G3 from Malvern. Particle Analytical further applies manual microscopes equipped with objectives for 40 to 1000 times magnification and a macroscope with objectives for 3.5 to 90 times magnification. A digital camera enables live recording of images. The images are processed with Image-Pro Plus software from MediaCybernetics. The measurement of the particles is thus operator independent and reproducible. All images are stored for complete documentation. The primary particles are dispersed in liquid or in air by vacuum dispersion on object glass prior to image analysis. Sample amount Particles 1 – 300 µm: 10 – 100 mg. Particles such as granulates and pellets over 300 µm: Min. 1-2 g of substance.